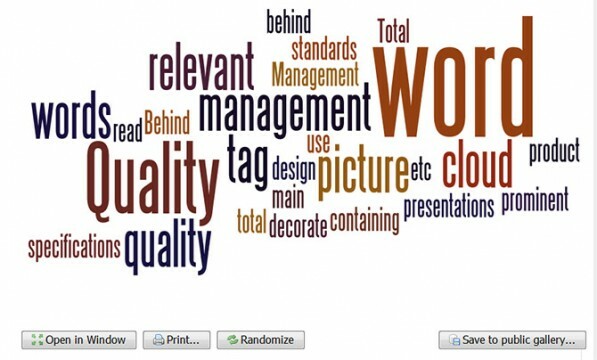 This article explains how to generate simple tag clouds that you can use in your own presentations. Accordingly to Wikipedia, a tag cloud is a visual representation for text data, typically used to depict keyword metadata on websites, or to visualize free form text […] this format is useful for quickly perceiving the most prominent terms and for locating a term alphabetically to determine its relative prominence. Tag clouds become very popular in the last decade not only to display tags in a website or blog and let the users direct access to group of relevant articles or posts in a blog, but tag clouds are also a very powerful visualization tool that can be used beyond websites. In fact, we have used tag clouds in many business PowerPoint presentations to help the audience perceive at a glance what is the purpose of a presentation. Likely, the most popular tag cloud generation tool is Wordle. It is a free online service created by Jonathan Feinberg that let you generate wonderful tag clouds online. You only require a web browser and Java enabled in your computer in order to generate tag clouds using this generator tool. 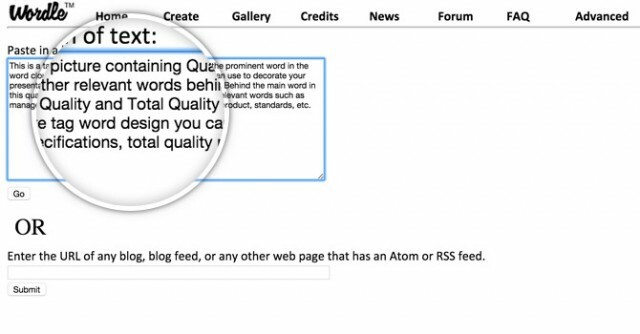 You can generate tag clouds from your own content of text or specify a URL with an Atom or RSS feed. 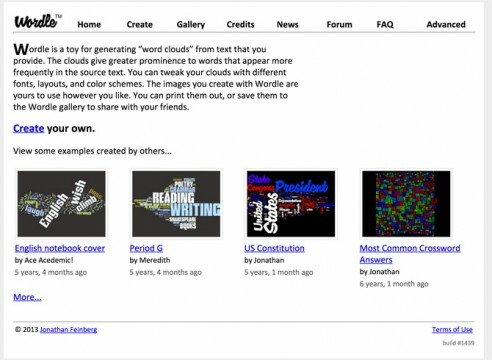 Visit Wordle.net homepage and then look for the Create link either in the homepage content or at the top menu. The next step consists in entering a bunch of text that you want Wordle.net to analyze and calculate the occurrence of words. Based on this information, a different weight will be assigned to each word and this will impact in the final design, as words with more weight will be displayed with a bigger font size. Those words with a very low weight will be displayed with a small font size. 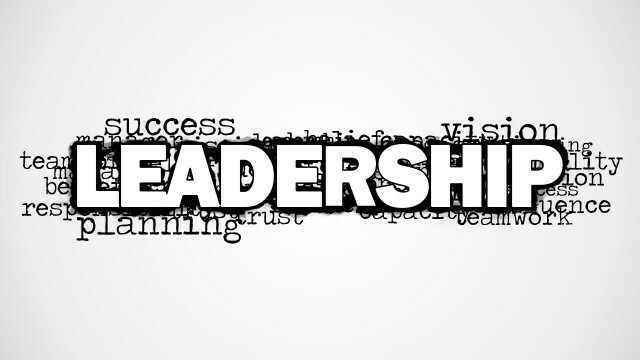 Tips: You can export any existing presentation that you want the Wordle tool to analyze and copy the text into this text area. Once you pasted the text click Go button. Alternatively you can enter a URL of a blog or website that contains an Atom or RSS feed. This is for example supported by the popular blogging platform WordPress so if you want to grab content from a blog powered by WordPress you can paste website link in the textbox instead of entering the bunch of text by yourself. When you click Go button or Submit then the word cloud will be generated. Here you can regenerate the word cloud as many times you want by clicking the Randomize button. You can also save it to a public gallery or print it. If you have a virtual printer driver like PDF Creator you can print it as a JPG or PNG image. 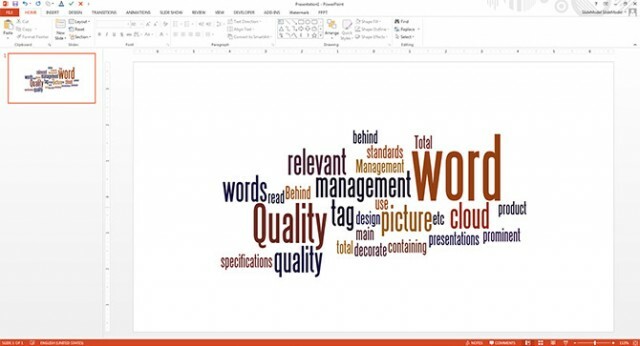 However, the easiest way to get the generated word cloud as a image is by taking a screenshot and copying it to the Windows clipboard or Office Clipboard. 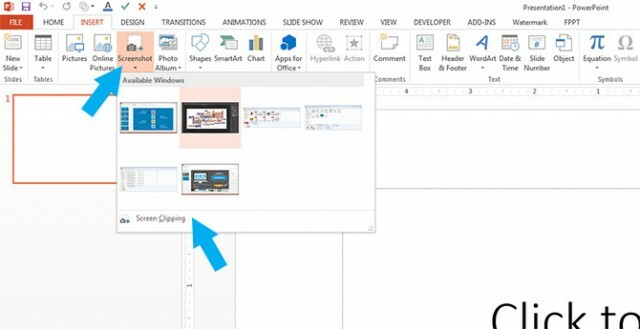 Using Microsoft PowerPoint 2013 you can take screenshots or use the Screen Clipping tool directly from the PowerPoint editor. In Microsoft PowerPoint 2013 you can take screenshots easily from the PowerPoint editor. Go to Insert -> Screenshot and then look for Screen Clipping tool. This will let you open a clipping tool and select any region in the screen. Make sure to select the browser page where you have generated the word cloud and draw a rectangle covering the word cloud image. Then the final screenshot will be inserted in the current slide. Below you can see an example showing the word cloud generated by Wordle once it is inserted in a PowerPoint presentation. Alternatively, you can use pre-designed word clouds that help the audience to perceive a particular content, topic or area of interest. 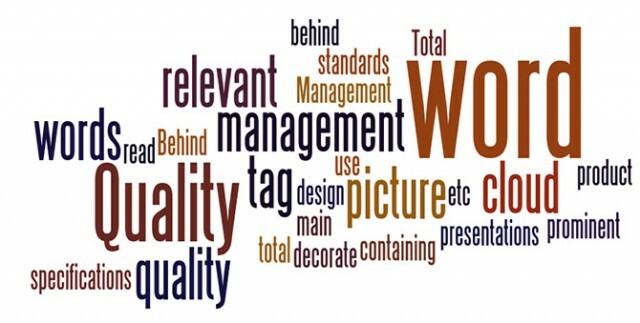 At SlideModel we have generated plenty of tag cloud designs for business presentations that can help to make impressing slides. Our pre-designed word clouds can be used in business presentations and we have used sophisticated design tools to add shadows and special effects to the word cloud, making them look really impressing and engaging. Below you can see some examples of pre-designed word cloud pictures that you can download from SlideModel. 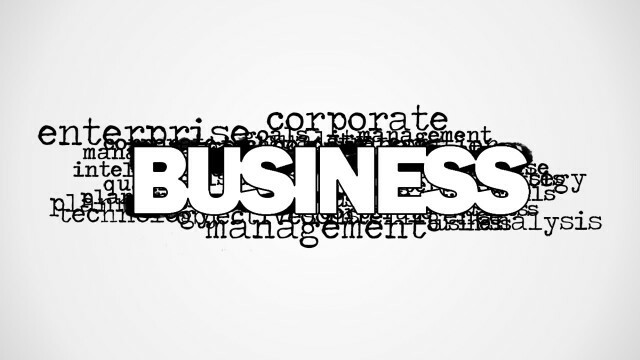 By subscribing to SlideModel.com you can download .pptx files containing these business tag cloud pictures and use them in your own presentations.